Bowers and Wilkins was founded in 1965 as a boutique audio company. They spent the next 45 years building speakers, before stepping into the headphone with their P5 headphones, which were released to a fairly warm reception – they proved popular after the usual caution involved in a company introducing an entirely new product category, and likely created a whole new crop of audiophiles given their broad availability through featured placement at Apple stores. Since their introduction, B&W has not seen fit to update the P5, as they did it right the first time – this freed up their engineers to enter yet another potentially lucrative new market segment, in-ear monitors. The new C5 in-ear-monitors represent the fruits of this effort – and clearly, they don’t cut any corners. B&W has used expensive materials and manufacturing methods to create what seems to be a very durable product; even the cords appear sturdier than many competing IEMs, with better-than-average strain-relief in the plug. While on the topic of the cord, the C5 includes the Apple-designed inline mic and three button remote hanging below the left earbud. Also speaking of the cord, B&W has done something odd with it up near the earbuds, in order to supplement the normal retention methods which some find less than comfortable – they call it their “secure loop design” and it promises better retention with better comfort – we’ll have a look at that shortly. 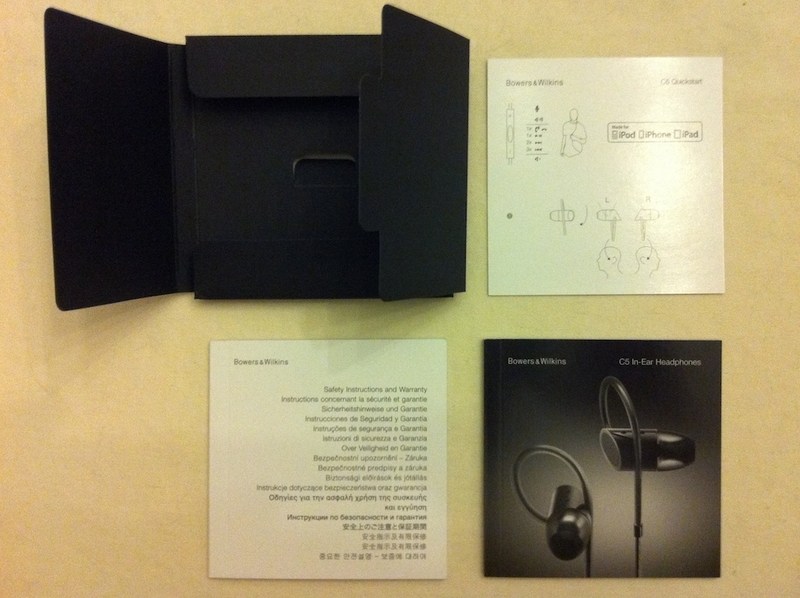 The B&W C5 arrives packaged attractively, in a black box made of heavy cardstock which prominently features the earbuds themselves, first on the box art, which flaps open to expose the real deal through a window – which are pretty attractive in their own right. 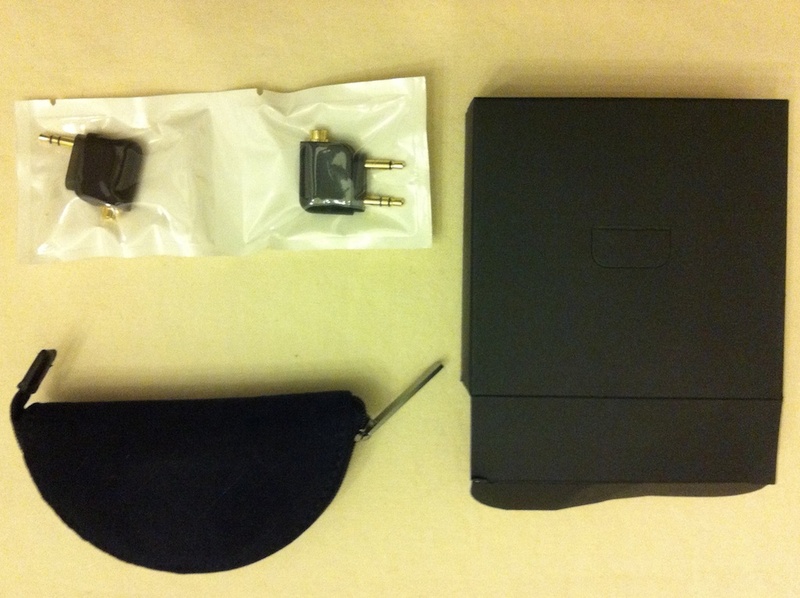 One gets access to the headphones through a panel in the bottom of the box, and a tray inside slides out containing the headphones on top, attached to a plastic insert. Underneath, one finds the included accessories, most importantly a small ziplock baggie full of silicone eartips, which are critical to to the sound of all IEMs, for their proper fit is necessary to produce anything resembling adequate sound. When one achieves this proper fit, they are generally rewarded with excellent sound, however. 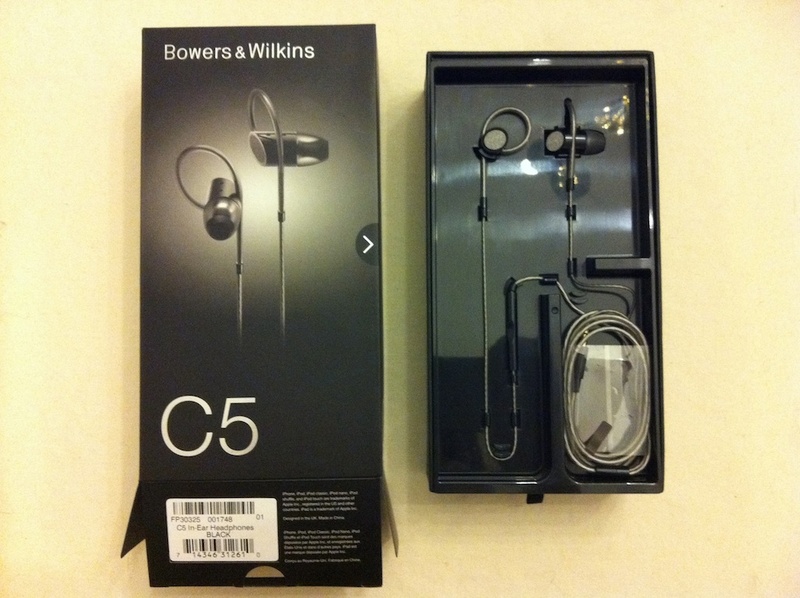 The C5’s selection runs toward the large end of the scale, but should fit a broad range of ears. Next to this, one finds a half-circle shaped headphone case with an internal cord-spindle, smelling strongly of real leather, though the lining appears to be a microfiber imitation suede, perhaps a concession to manufacturability as much as cost. Also packed in the space under the headphones themselves is a short but quite-adequate manual, and two adapters – one a right-angle plug for preventing cable strain or damage, the other an airline adapter. For the Macbook Air toting, jet-setting crowd, this will be a welcome addition… if people still watch in-flight movies instead of bringing their own content on their own devices. Still, batteries die and this should make a nice backup plan. Further, these adapters couldn’t have cost them much, but definitely contribute to the feeling that what you have in front of you is a high-end product. 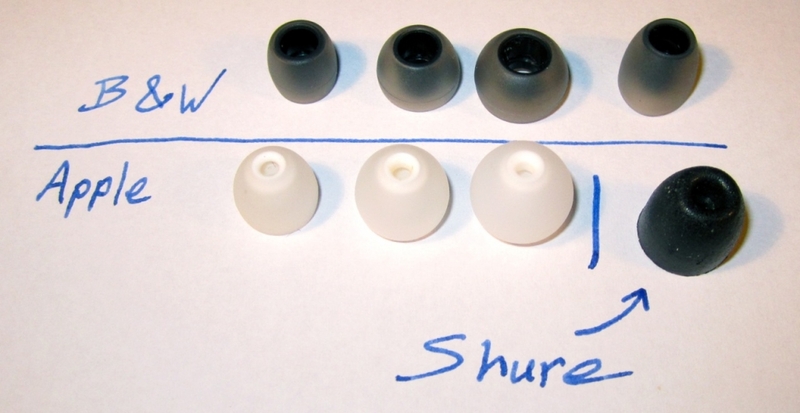 I mentioned the multitude of silicone flange tips included in the box before, and let me return to this point – in any IEM, fit is critical to sound quality. 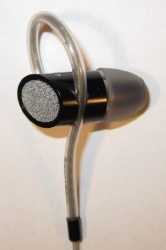 All IEMs depend on achieving a good quality, airtight seal in the ear canal in order to produce sound. The B&W design is supplied exclusively with single-flange silicone tips; these are the easiest to insert and remove, but can be the most finicky compared to multi-flange designs (which can sit too deep for comfort, and are simply too long for some ear canals) or disposable “foamies” (which tend to get really nasty and require replacement every couple weeks to couple months). These supplied flange tips all run toward the larger end of the pack at the end the sound comes out of, and when I pulled off the attached bullet-shaped tips to try a smaller spherical tip, I discovered why – the sound tubes are, compared to many other IEMs, simply huge, with an outside diameter of four to five millimeters. In comparison, Future Sonic’s Atrio, as well as a few Shure models, are around 1.5 mm, and Apple’s dual-driver IEM clocks in at about 2.5mm. In spite of this, the smallest C5 eartip is slightly smaller than the smallest Apple eartip, and doesn’t have much room to spare for flex. On the other hand, if the small tips fit your ears well, you won’t need much flex. The monster tube also suggests they are capable of moving quite a lot of air, which makes me hopeful for their bass response. The unavoidable downside is that those users with smaller ear canals should consider looking elsewhere, or if particularly undaunted, consider custom-molded eartips. These can be expensive if made by an audiologist, but the daring could consider using a commercial earplug kit with directions found on the internet to roll a pair for under forty bucks. As always, the potential for an expensive mishap cannot be ruled out, so this is at your own risk. Though if any earbuds justify professionally-crafted custom tips, I must say that this is probably the pair!